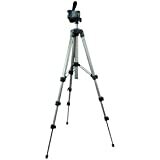 – Tripod with 4-level extendable legs. – 90° vertical platform. – Mid level bracing. This entry was posted in Discount Photography and tagged Small, Tripod by Ball Photo. Bookmark the permalink.